Branded sweets are sweets (or candy) that have had your business’ branding imprinted on them, either directly on the sweet or as part of its packaging. Your brand can be represented in the form of a logo, a tagline, a message, a picture, or any other visual representation of your business. Of course, branding is not limited to a business and branded sweets may also be personalised for an event or a group. The opportunities are endless! 1.2 What are branded sweets used for? There’s a sweet for every situation, and we’ll help you find it. Please see section 3.0 for more information on the uses of branded sweets. 1.3 How can sweets be branded? Sweets can be personalised and branded two ways. The first is that your logo (or another visual representation of your brand) is printed directly onto the sweet, such as in the cases of some rock sweets. In these instances, the logo is printed using special food inks that have been approved by the food industry for safe consumption. Alternatively, your logo (or another branding element) can be printed on the sweet’s packaging. This tends to be the most popular option and applies to most of our sweets. For example, your logo may be printed on the wrapper of a chocolate bar or on a card that is attached to your netted sweets (like chocolate coins). Your logo may also be printed on a sticker that is then stuck to the sweet. If you’re unsure about how your brand will appear on your chosen sweet, get in touch and we’ll let you know. 1.4 What are the benefits of using branded sweets? In today’s marketing environment, it’s more important than ever to target customers in a way that appeals to them. Mass emails and large marketing campaigns have their place, but it’s also important to consider more personal, direct forms of marketing. Branded sweets are an easy, cost-effective way to delight your customers. They’ve been shown to increase brand awareness, drive brand loyalty and offer a simple way to build a deeper, more personal relationship with your key stakeholders. Branded sweets can up-level your customer service efforts by demonstrating how much you value your customers’ business, or they can help you attract new customers by offering a positive, memorable first impression. There are several providers of branded sweets out there; however, it’s important to consider a range of factors when choosing a supplier. You must think about the quality of the sweets, including where they are produced. As an example, we ensure most of our chocolate is sourced from reputable chocolatiers in Belgium. Some other providers may choose lower quality sweets in the name of profits. Also look for companies that have a positive reputation. Ask for referrals or use online review services like Feefo to investigate whether a company is known for delivering quality products on time and on budget. We may be a little biased, but with 50 years of combined experience in the market of branded promotional items, we like to think we’re the best option available on the market today. As with most marketing services these days, your best bet for finding a supplier of promotional sweets is to look online. At The Sweet Team, we’ve been in the branded sweets business for many years. We know sweets inside and out and are here to give you expert advice and top-notch customer service. And we won’t be beaten: if you’re lucky enough to find someone cheaper, we’ll happily match any written quote. 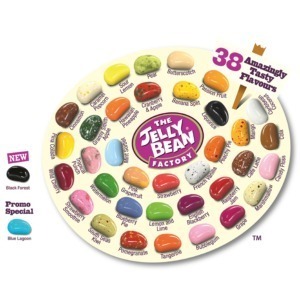 It will likely be difficult to find branded sweets on the high street simply due to the highly personalised nature of the product. You may find some bulk sweet options at wholesale sweet and confectionary shops; however, these companies may charge a high premium on branding those sweets, if they do it at all. If you would prefer not to buy online, simply give us a call – we can walk you through the process and put your order through manually. 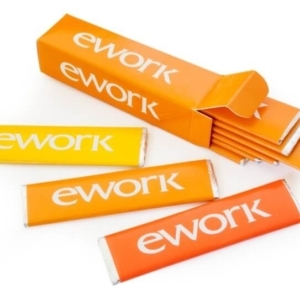 Branded sweets are popular options for corporate events such as exhibitions and conferences. These sweets can be used as part of a corporate display or presentation or can even be included in a conference goodie bag. Promotional sweets offer an enticing way to grab an audience’s attention, particularly at exhibitions where you are surrounded by dozens of competitors. Once the word is out that your stand has sweets, you’re sure to attract a bigger crowd! Corporate events are easy to plan and order for as you can often contact the event’s coordinator to determine attendance numbers. We always recommend ordering extra (after all, we’ve all been known to sneak an extra sweet or two when someone isn’t looking). Corporate events are not the only events where branded sweets can be used, however. Personalised sweets also make a great addition to other special events and celebrations, including weddings, milestone birthdays or large parties. 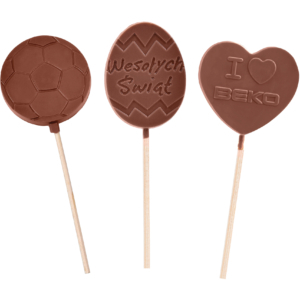 You do not necessarily have to have a logo to personalise your sweet. We can also print things like names, ages and special messages on your sweets. You can choose to provide your own design or get in touch with us about our logo design services and we can create one for you. Sweet jars shouldn’t just be limited to hotel reception desks! Any business with a local presence can charm customers and visitors with a jar or bowl full of delicious promotional sweets. Branded sweets can also be used throughout the office for employee enjoyment, such as in conference rooms or staff lounges. Branded biscuits make for a particularly tasty addition to a morning coffee. The sweets often have a way of sneaking into pockets and handbags, so your brand will continue to make an impact far beyond your office walls. Branded sweets have a great place in schools – from primary schools all the way up to universities. They can be used for special events (such as Halloween or graduations) or are a fantastic way for student unions, clubs and other groups to attract new members or simply raise awareness of their presence. They’re also a great option for recruitment departments as part of their outreach efforts, especially when trying to attract students to their stands at college or university fairs. Branded sweets also make a great gift, no matter the occasion. Advent calendars or boxes of chocolates make great holiday gifts for customers or partners. Chocolates, mints and other sweets also make for thoughtful thank you gifts to employees or clients. In our opinion, every day is a great day for a sweet little surprise! If you’re in the habit of sending out physical promotional mail to your customers, clients or other stakeholders (such as company brochures or books), a branded sweet attached to the packaging can help ensure it gets opened – not just thrown immediately in the bin! 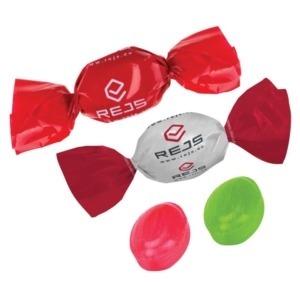 Many of our promotional sweets are lightweight and compact, so you don’t have to worry about huge changes in your shipping costs. 4.0 – What kind of sweet do you need? The Sweet Team does have order minimums on our sweets. The quantity varies between sweet type, and you can find this information in the product description. If anything is unclear, please get in touch. Branded jelly sweets, such as jelly beans, jelly hearts and other jelly shapes (like those produced by Haribo) are fun, colourful and delicious. They’re perfect for situations where you want to remind the recipient of their childhood. Jelly sweets typically come in small plastic bags but can also be delivered in jars or even a pyramid shape. 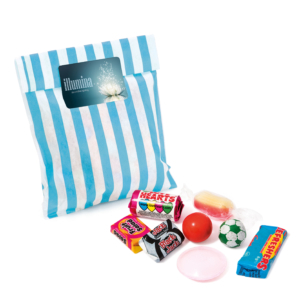 These promotional sweets are great for goodie bags, promotions or special events. Nothing says fun like a lollipop. Our lollipops can be branded directly on the wrapping (in the form of a plastic wrapper or a cardboard box) or using a sticker. Branded lollipops are individually wrapped, making them ideal for promotional giveaways, goodie bags or random gifts to clients or employees. Netted sweets are perfect for situations where you want to give a little something extra – not merely a single sweet, but an entire bundle of them. From chocolate coins and hearts to stars and Christmas balls, there’s a netted sweet for every occasion. Your logo is attached to the netted sweets using a cardstock tag. We can print on both sides, allowing for additional branding opportunities. These netted sweets are ideal for holidays (particularly Christmas and Easter) but also make great additions to corporate events, school events and other special occasions (such as weddings or birthday parties). Branded retro sweets make an extra special impact, as they’re likely to bring the recipient back to a former time. Retro sweets can stir up happy memories – and when those memories are associated with your brand, that’s where the magic happens! 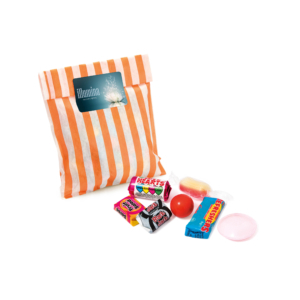 Our branded retro sweets make for great thank you gifts and will also help you stand out at trade fairs, exhibitions and other corporate events. Rock sweets are a clear favourite at The Sweet Team. These sweets can be branded in two ways: your branding can be printed directly onto the sweet (using food dyes) or can be wrapped around the sweet via a paper label. Rock sweets are typically mint flavoured but can be personalised according to your needs. 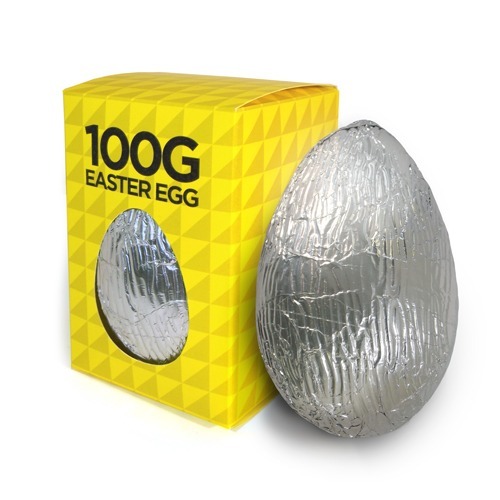 These individually wrapped sweets, whether round or stick-shaped, are perfect for just about any marketing scenario, including corporate events, office reception desks, and goodie bags. Advent calendars are truly unique promotional items – and a great way to ensure people are thinking of your brand for at least 24 days a year. Our advent calendars are available in three forms – traditional, desktop, and 12-day calendars – and can be branded with your logo and personal message. You can even choose to create an entirely unique design for the front of your advent calendar. Branded advent calendars make fantastic holiday gifts, but can also be used for giveaways, events and trade shows. 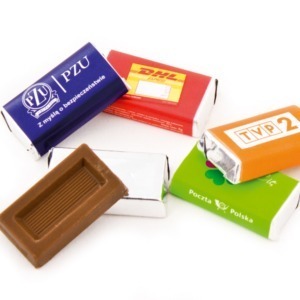 Our promotional chocolate bars and boxes can be branded in a wide variety of ways. Your logo (and/or design) can be printed on the chocolate bar’s wrapping or box. 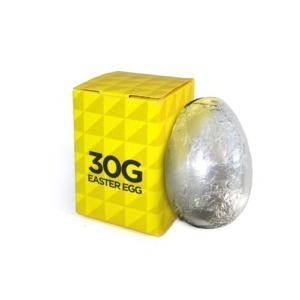 You can also place your logo on the packaging using stickers or even imprint your logo directly onto the chocolate using moulding. There’s no bad time to use chocolates in your marketing. 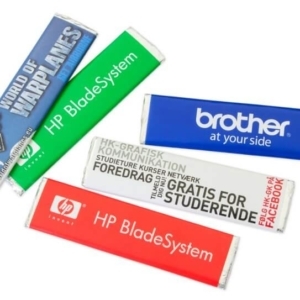 These promotional sweets are excellent for hospitality (i.e. hotels or restaurants), corporate events (particularly trade shows) and as corporate gifts. 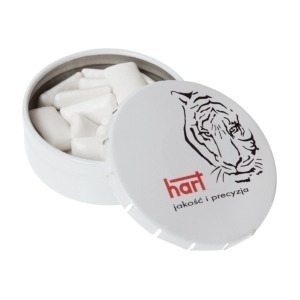 Our branded mints are available in a wide variety of forms: metal or clic clac tins, blister packs, cards, rollers, drops and the classic plastic container. 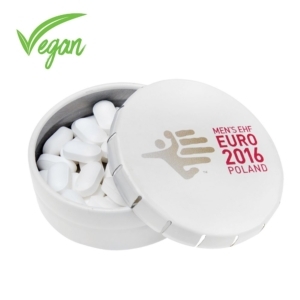 Mints are ideal promotional sweets as they typically end up being carried by recipients for a long time. Your logo or message can be printed directly onto the packaging and you also choose the colour of your mints (for most products). Promotional drinks, such as water and fruit juices, guarantee that your brand will get in front of your intended audience. Branded water bottles are particularly useful at corporate events like conferences and trade shows, while branded fruit juices, energy drinks and smoothies are also great for hotel rooms and special celebrations. Your branding – such as your logo, tagline, or campaign message – can be applied to these promotional drinks via the label. 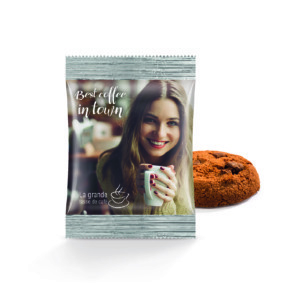 We also offer a range of other promotional sweets and snacks, including tea bags, biscuits, sugar sachets, chewing gum, fortune cookies, candy floss, peanuts, popcorn, jam and more. Please browse our online store for more information and do get in touch if you have any questions. Alternatively, your logo may be printed directly onto the sweet (such as with some rock sweets). In this instance, the logo will be printed using special food inks that have been approved by the food industry for safe consumption. As outlined in section 5.2, we carefully select the factories we work with to ensure our sweets are made using only the best quality, safest, most delicious ingredients. As per EU guidelines, all sweets come with a full ingredient and nutritional information list. 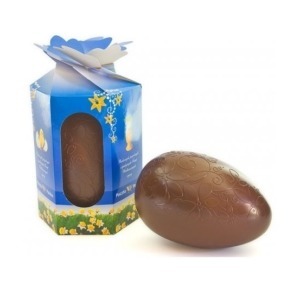 We have carefully chosen factories that specialise in certain sweets, to guarantee the best quality product possible. All our factories are based in Europe, with most of our chocolate being produced in Belgium – home to the famous (and delicious) Belgian chocolate! If you’re not sure what you’re looking for, the best way to choose your promotional sweet of choice is to browse our website. Using the navigation at the top of the page, simply browse our various categories and sub-categories. If you still can’t decide what sweet is best for your business and situation, give us a call. Our team of experts is on hand to listen to your needs and give their advice on the best promotional sweet for you. If you know exactly what kind of sweet you’re looking for, you can either go directly to that category in our navigation or simply use the website’s search feature. If you can’t find the product that you’re searching for, consider using alternative language (such as “lollipops” rather than “lollies”). If you can’t find what you’re looking for, let us know! We love hearing about our customers’ ideas and bringing them to life. Once you have browsed through our assortment of sweets or found the sweet that you are looking for, click the “ORDER ONLINE” button. There will be a different order minimum for each sweet; please refer to the product description for more information. Please refer to section 7.1 for information on how to complete your order. During the ordering process, you will be prompted to upload your logo so that we can brand your sweets. To ensure your logo is suitable for printing, please visit our FAQ page for information on logo requirements. Once you have identified which sweets you would like to brand and purchase, online ordering is very easy. After clicking on the ORDER ONLINE button, you will be prompted to upload your logo so that we are able to customise your sweet. You will then be prompted to fill out your order form with details such as your billing information, shipping information, and whether you require expedited shipping. There will also be a form where you can give us details such as event date (so we can advise on shelf life), other promotional items needed, and anything else you feel we may need to know. We will always provide a mock-up of your sweets before printing and shipping your order, so you can confirm that everything looks just the way you want it to. 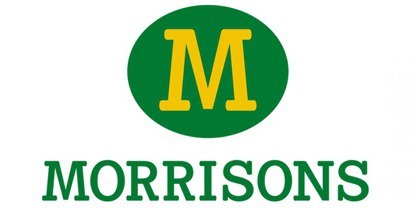 If you prefer not to order online, you can order over the phone by calling our customer service team on 020 81 660721. We’re on hand to advise you an all aspects of your order and manually process your order over the phone. The Sweet Team accepts payment via credit card (including American Express), debit card, PayPal or bank transfer. Our express turnaround service is available when you need your sweet fix FAST. Simply add this option to your order during checkout or contact us for more information. Don’t have a logo to be printed on your branded sweet? No problem – we’ll design you an eye-catching logo that really represents your brand and gets it noticed. Just get in touch and ask about our logo design services. If your question hasn’t been answered in this buyer’s guide, please visit our FAQ page for answers to our most commonly asked questions. If you still can’t find what you’re looking for, get in touch! We’ll do all we can to find the answer.